Owner and founder Jim Grimes, photo courtesy of Bridgehampton National Bank. 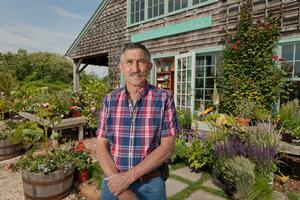 Jim was born and raised in Montauk, and it is where his interest in horticulture and landscaping originally began. While still in high school, Jim worked part time for a local landscape firm where he enjoyed working with plants, especially plants native to the eastern end of Lond Island. He then went on to attend college at Alfred University and pursued courses in horticulture. His interest originally was in research, but felt he needed the hands-on approach to develop his strong sense of design. He went on to earn a degree in Floriculture Production, and graduated in 1976. After graduating, he moved back to Montauk and began working locally, and decided to start his own landscape design & installation company in 1978. After several years in business, Jim realized that he needed to begin growing some of the native materials he used, and could use a retail operation to supply his landscaping clients and the public with species that thrive here. And with that, Fort Pond Native Plants was born. Housed in a custom timber-peg style building one block north of Main Street, Fort Pond Native Plants offers customers a unique shopping experience. A gift shop featuring locally made items, research library for new and seasoned gardeners, and the offices of James C. Grimes Land Design are found inside the shop, while manicured grounds surround the building, offering customers the opportunity to browse our extensive selection of native and non-native perennials, trees and shrubs, along with unique varieties of seasonal annuals, tropicals, and houseplants.